In cities land is squeezing very fast. Cost of land is a big constraint for gardening. 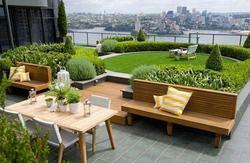 We convert your terrace into live plot in which you can do and enjoy natural gardening. In our technology terrace becomes a huge container which does not allow water leakage and durable in nature. - We develop terrace garden with latest technology of drainage system, tested & certified bio-products of soil profile for lawn & plants. - Drain board /Drainomat to be used for drainage system; size as per depth available. - Selection of plants & grass species specially for terraces. We provide: Annual and perennial care and maintenance Pruning,trimming,and care for shrubs and perennials. Being a distinguished business name, we are enthusiastically involved in the arena of providing Terrace Garden Designing Service. We are assisted with a crew of adroit personnel who render these services in the most effective way within the postulated time. As well, these services are broadly appreciated amid our patrons’ for their promptness. providiing and laying 4mm app membrane with the help of heating torch. b) Laying a layer of bituminous primer.